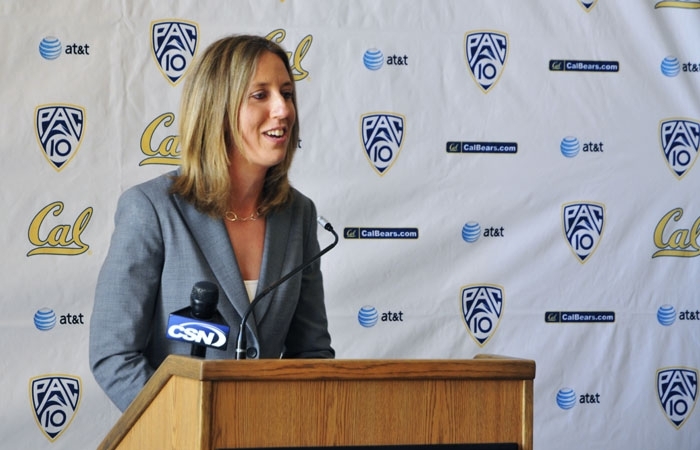 Lindsay Gottlieb, a former assistant at Cal under Joanne Boyle, was introduced as the Bears' new head coach at a Tuesday press conference. Lindsay Gottlieb was 24 years old when head coach Joanne Boyle hired her as her top assistant at Richmond. Only a few years fresh off the end of her own playing career at Brown, she couldn't even rent a car for recruiting trips without a note from the athletic director. It's been nearly a decade, but the 33-year-old Gottlieb - whose resume has since been padded with a Cal associate head coach spot under Boyle and her most recent job at the helm of UC Santa Barbara's program - still possesses the same sort of youthful fire. That energy was the main reason behind athletic director Sandy Barbour's decision to hire the familiar face as a replacement for Boyle, who left Cal recently for Virginia. "I've heard she's passionate," sophomore point guard Layshia Clarendon said. "That's one thing I've think I've heard most about her, is that she cares so much about her players, which is one thing that I really loved about Coach Boyle and about her that I think is going to continue on." Gottlieb's return after three years in Santa Barbara, a move signaled by a Monday announcement and Tuesday press conference, comes on the heels of a disappointing season for Cal. After winning the WNIT in 2010, Cal began its latest campaign with high expectations and what looked like a good shot to return to March Madness. Instead, a young group with only two seniors - neither of whom started - went 7-11 in the Pac-10 and 18-16 overall. Its season ended in the second round of the WNIT. Before Gottlieb left for UCSB, she and Boyle led Cal to three straight NCAA Tournament berths and 20-win seasons. The streak continued for another year after Gottlieb's departure, and became the best stretch in program history. With her hiring, the Bears hope those days return sooner rather than later. "Certainly, there is no rebuilding," Gottlieb said. "There's too much talent, there's too much heart in this group. What I'm hoping is to take a firmly established program and say, 'Where else can we go?'" Six players transferred from Cal during Boyle's six-year tenure, most recently starting power forward DeNesha Stallworth. The sophomore led the team in scoring this past winter, averaging 13.3 points, and was named to the All-Pac-10 Freshman team her first season. But to hear it from those who know her, Gottlieb's reference to Cal as "one of the gem's of the women's college basketball world" doesn't seem far-fetched at all. "I was talking to the NCAA, 'Can I get two more years?'" joked graduating senior Rachelle Federico, who played under Gottlieb before she took the UCSB job. "'How much does it cost to get two more years of eligibility?' I've been talking to Layshia and I let her know, 'You're in great hands.'" In her first season at Santa Barbara, Gottlieb led the Gauchos to a 15-1 conference record and an NCAA Tournament berth, and was named 2009 Big West Coach of the Year for her efforts. She was the first coach to win 11 conference games at UCSB, and also the first to post a winning inaugural season. The remainder of her tenure was perhaps less spectacular - Gottlieb went 56-39 in three years - but her strength lies in her ability to establish strong relationships with her players, which she said would be her top priority with her new team. Cal does lose a very strong recruiter in Boyle. Her 2009 haul was ranked third in the country by ESPN and contained seven top-50 players. And while Boyle didn't enter her first season at Cal with her own recruits - stars like Ashley Walker, Devanei Hampton and Alexis Gray-Lawson committed to Caren Horstmeyer - she was able to take them to the Sweet 16 in 2009. Now it'll be up to Gottlieb to try to do the same. "Her door is always open for anything you want to talk about ... How are you gonna get a kid to dive on the floor for you and get a loose ball if you're not gonna have a relationship with them?" Federico said. "I think it's gonna be something that they've never experienced in a coach before." The article's photo was originally credited to Summer Dunsmore. It was, in fact, taken by Rashad Sisemore. The Daily Californian regrets the error.